Suffering from inbox overload? Afraid you’ll miss that next important email? Frustrated with managing your To-Do List? Wish you could get more done? 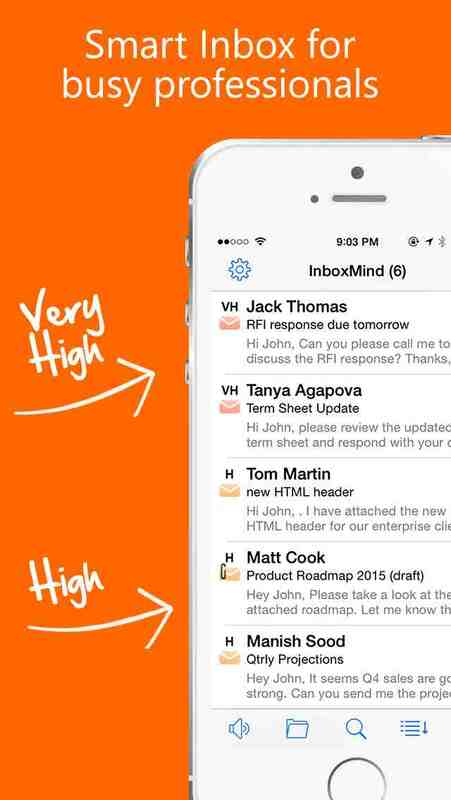 Welcome to InboxMind, an intuitive smart app that prioritizes your email by learning from you. InboxMind keeps you focused on what’s really important, tracks your actions and cuts through the clutter! 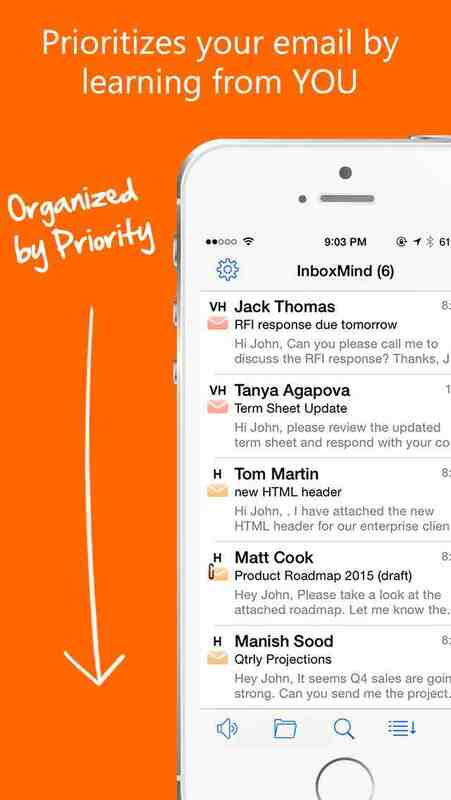 Choose your priorities and let InboxMind do the rest, while you get to work. And thanks to our innovative InboxRadio feature, you can even listen to a summary of your inbox so you can stay up to date, hands-free and on the move. InboxMind is compatible with Office 365, Microsoft Exchange, Outlook.com, Hotmail, MSN and Live email. We offer a host of innovative features to make your life easier. InboxMind patented technology immediately learns about your priorities from your email history, calendar and contacts. It automatically assigns a priority to each email – from ‘Very High’ and ‘High’, to ‘Medium’, ‘Low’ and ‘Someday’. But InboxMind doesn’t stop there. It continuously learns and refines your ever-changing priorities based on your day-to-day activities. It truly is a thinking inbox, personalized for you! And you’re always in control. 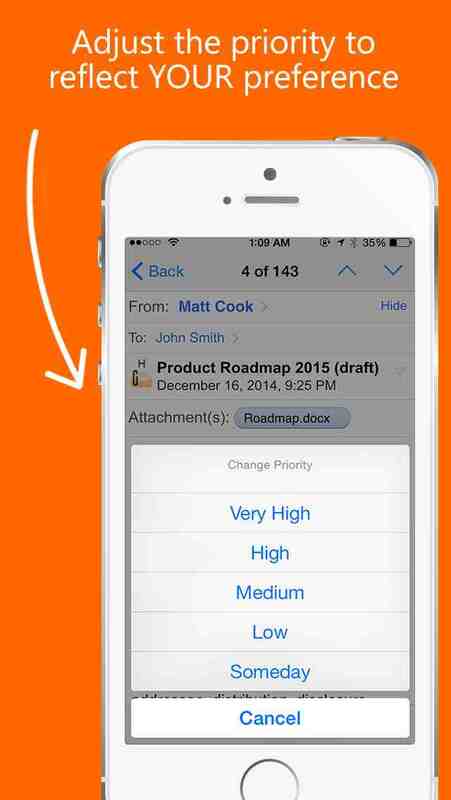 You can adjust an email’s priority with a simple tap to reflect your needs and preferences. InboxMind immediately learns & becomes more accurate! InboxMind is flexible and lets you easily set your own preferences. Expecting an email from an important contact? No problem, just prioritize it in advance and InboxMind will be on the lookout. Working on a critical project? No worries, add keywords and InboxMind will make sure you never miss an important email! Listen (that’s right, listen) to your important emails as soon as they arrive. 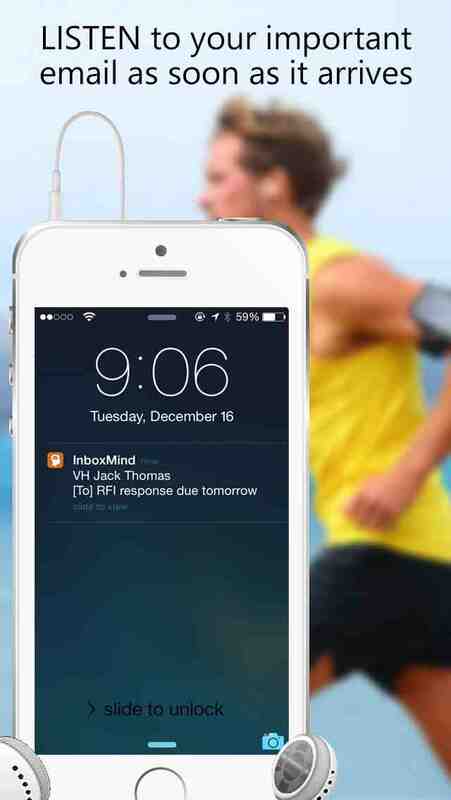 InboxMind’s smart alerting technology - InboxRadio - converts your inbox into an intelligent radio. 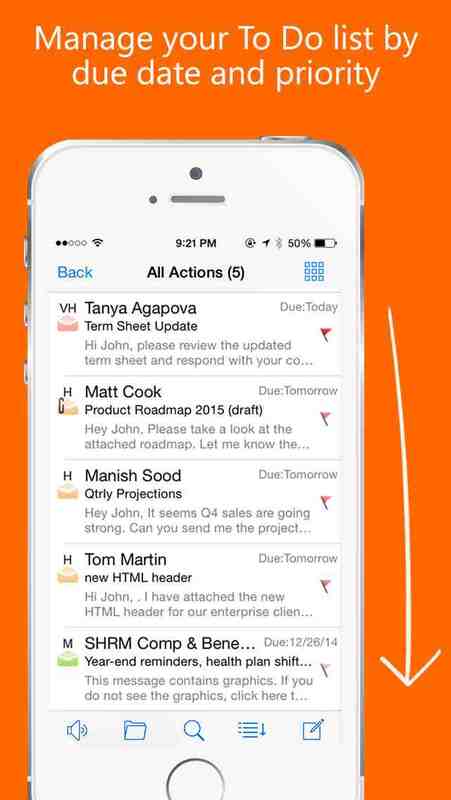 It can even read out loud a prioritized summary of your inbox. At your desk or on the road, InboxMind keeps you on top of your game! Not all your emails require action, so why not let InboxMind prioritize the ones that do? Quickly flag your emails for action ‘today’ or ‘defer’ them to a later date. InboxMind will track all your actions by due date and priority. Once you're done, simply tap ‘Complete’ and your completed emails will automatically be removed from view … leaving you to concentrate on what remains! InboxMind works side by side with your existing Inbox, without disrupting your emails. The InboxMind App interface and buttons are similar to those in your existing inbox, and are easy to use. You don’t have to change the way you work, create complicated folders and filters, or use an unfamiliar interface. You can easily configure your own smart views and alerts the way you want it. You only see what you want to see! InboxMind is more secure than traditional email apps that store your ‘password’ on their cloud servers. InboxMind App encrypts your ‘password’ and secures it ‘locally’ on your own device. Which means your ‘password’ is never transmitted to us or stored in our cloud servers. InboxMind cloud servers never store your email content and we will never sell information about you to third parties! Data within the Inbox App is secured using AES 256-bit encryption algorithms. Any data transmission is encrypted using industry-standard SSL (https) encryption. Let InboxMind work for you around-the-clock. Download InboxMind App today!